This salad is fresh and crunchy and has sustenance thanks to the freekeh– these roasted grains of young, green wheat are high in fiber and essential minerals. Wrap the beets with thyme and garlicin aluminum foil androast at 325 degrees Fahrenheit for 2 hours or until tender. Bring water to a boil and cook the freekeh 20-25 minutes until it is tender to the bite. Drain and keep aside. Peel the leaves of the red chicory and cut in half lengthwise. Peel the grapefruits and cut into segments. Remove the meat from the chicken and shred into large chunks. Season with salt and pepper. Finely chop the mint and cilantro put some aside for garnishing. Mix the chopped herbs with the Hellmann's® Mango Pineapple Vinaigrette. Peel the beets and cut into wedges. 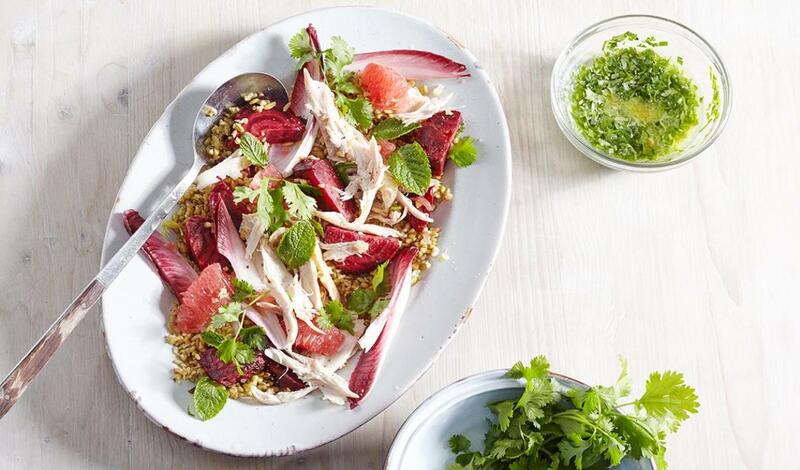 Tossthe dressing withthe freekeh, red chicory leaves, grapefruit segments and beets. Divide over plates and top with the chicken. Garnish with fresh cilantro and mint leaves.